For the final assembly of the school year before Valediction, Upper School grade director Ms. Brady chose to focus on the many talents of our student body. Performances included “Autumn Leaves” by Joseph Kosma performed by Adrien Gomez, Mitch Shapiro, Harris Marks, Owen Fox-Whelpton, and Dylan Healy. Bjorn Shockey, Ketan Mampara, Jalen Richardson, Zander Shoag did a juggling performance, and sophomore Felicity Ryan recited her Poetry Out Loud winning rendition of Henry Wadsworth Longfellow’s “The Children’s Hour.” Other performers included Jalen Richardson, Brayden Young, Rodney Goldring, Luca Camponovo, Emma Olson, Coree George, Jakai McIlwain, Milan Brown, Ashley Leach, Amaya Tatum, Niyjah Wright, Kevin Macario, Lucie Warga, Layla Stewart, and Khiya Derricott. 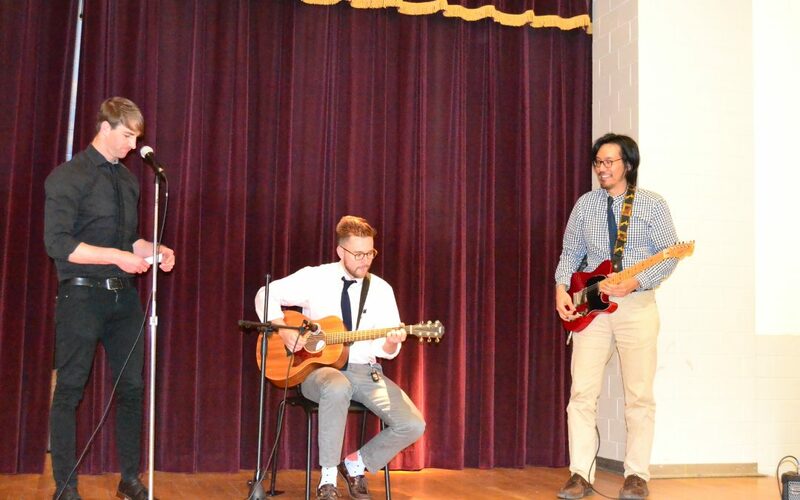 Even teachers like Mr. Starnes, Mr. Hotchkiss, and Mr. Liu got in on the action, with a musical performance.